September 26, 2015 shall forever be noted as the day when Darwin took her first unassisted steps. Kid does things on her own time, but boy when she does…6 or 7 in a row across the driveway! So proud. As anyone with young children knows, childcare is a huge stressor. Finding care you’re comfortable with, has an opening when you need it, and is affordable can be a nightmare. We have been extraordinarily lucky to have been able to cobble together care for Darwin and reduce work hours so that we have not had to put her in any situations we haven’t been completely happy about. When Darwin was about 6 months old Leah was told her hours were going to be cut significantly, as the woman she had originally been hired to cover for on maternity leave was returning to work. The following week we found out that a spot had opened up in the infant care room in the daycare facility that we had signed up for. This facility is one of the best in town, and has a discount for faculty where I work, so we had been excited about a spot that was adorable. Until Leah’s hours were cut. Suddenly we not only didn’t need care, but couldn’t afford it either. So we had to pass on the spot. Then the day the woman was supposed to return from leave…she resigned. That left Leah with hours, but us in the same childcare bind as before. I had some choice words about the whole thing. Anyway, since then we have been trying to figure out how we’re going to balance childcare as Leah starts her PhD program (tomorrow!) and I continue to work. Then the best opportunity ever fell into our laps. One of Leah’s fellow students and a friend posted on Facebook that they were looking for childcare. We talked and our schedules worked perfectly. We have similar approaches to parenting, and they have a three and a half year old and a 15 month old. Their older kiddo is in preschool while I have both wobblers, then the kids are with her in the afternoon. Friends, childcare share is amazing. I get to spend three mornings a week playing with two babies, watching them interact and grow. They have fun (mostly), we go to the park, the library, or just on walks. They play on the little slide at our friend’s house. They’re both still nursing so we’re each able to nurse rather than bottle feed (hello less pumping, hooray!) And Darwin is now copying things that her little buddy does. Like easy with a spoon. Or climb the slide and slide down. I feel like we hit the jackpot. I’ve been less than diligent about updating lately, due in part to a parade of illness. It began with Leah getting a terrible cough, then Darwin got a cold, which she promptly shared with Leah. This cold came with coughing, vomiting, and a low-grade fever, and caused us to cancel Darwin’s birthday party. Over which I am still pretty heartbroken. The icing on the cake was when Darwin went down for a late nap yesterday (just in time to make us late for our friends’ twins birthday party), and woke up with a fever of 103.4 degrees. Poor kid was miserable. Leah had a migraine, and I started getting a sore throat. All I could do was laugh. This morning Darwin woke up at 5:30 (2 hours earlier than usual, and after nursing most of the night), but her fever was down to 100.1. Thank goodness. Hopefully we’re on an upswing and I’ll have the time and energy to write a 12 month post, and talk about our awesome new childcare swap! It is 4 am on September 10th. This time last year we were on our way out the door to the hospital! We wouldn’t return again until we had a one up. This year I’m nursing a sweet, soft, snuggly baby back to sleep. I could not have acanticipated the wonder and the joy, the levels of exhaustion I would reach, the tears of all kinds, the depth of the love I have for this kid and our little family. I feel like the luckiest person in the world at this moment. I had every intention of writing about my pregnancy as it happened, then a year after it happened, and here I am, a year past my due date without having managed it. Ah well. One thing being a parent has taught me is the joy of letting go of things that are not vital in the moment. But today is September 8th. It was the date I focused on for a whole 9 months of my life and so it will always give me pause when I see it on the calendar. The night of my due date the minister from our church (I’m a UU in case the whole church thing throws anyone off) came and did a blessing way. I was surrounded by some of the strongest women in my life and I felt their strength hold me up while I labored the very next day. Reaching my due date was a little hard. Everyone expected me to go early. I was born at around 35 weeks myself. I never really expected to be pregnant the day after my due date. I began to worry that I would go really late instead. In spite of the fact that I knew that average pregnancies last 40 + 5, I felt pretty funky all day. For those who end up in this situation and have had no signs of impending labor, take heart: I had no false labor. I went from nothing to 3-1-1 contractions in about 2 hours. A friend stopped by my office today. One of those people who comes in and out of life without it feeling like you’re neglecting them or vice versa. I haven’t seen her in a little over a year. She’s almost six months pregnant. I couldn’t have heard better news today. 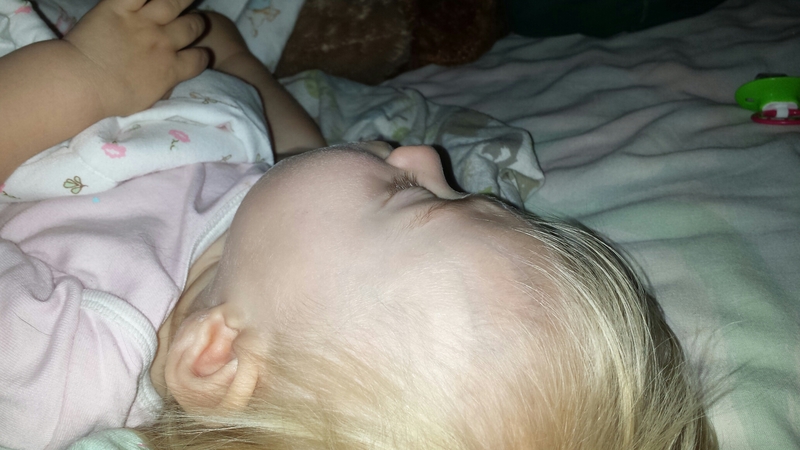 And now I am laying in bed with a nearly one year old sprawled out beside me, fast asleep. I’m thinking about how long and how short a year is. Could I have anticipated how incredible parenthood would be? I don’t think I came close to comprehending. Nor how challenging. I can’t wait to see how Darwin grows and changes this year. In other, more day to day news, we began a childcare swap with friends who had a sweet little boy a couple months older than Darwin. They also have a sweet 3 year old who will be in day care (although I don’t mind being a backup for her either). I can’t even begin to describe my joy at this arrangement. Between the ability to play with another kiddo, me getting to play with another kiddo, and the fact that they do beer and pizza night in a regular basis? Success. And love to all you new mamas who are having a bit of a struggle with your new role. I hope each of you has someone, or a village, to hold you up. And if not, you have a community of bloggers here who seem to be entirely ready to do so. You have my email. Use it any time you need. Molar number two is through! We are half way through the emergence of baby teeth. Interestingly, it is also the first tooth out of standard order. Darwin now has all 8 incisors andthe top and bottom front molar on the right. And yes, I have the indentations to prove it.